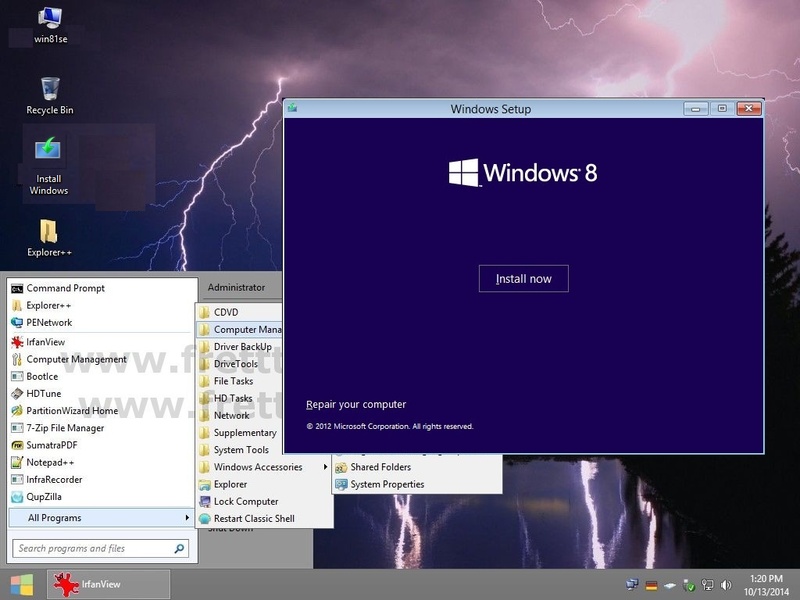 How to integrate 'Win 8.1 Installer' within 'Win8.1SE' ? Actually I want to create a Windows Setup similar to 'Ubuntu Live CD' which 'Boot to Desktop' and pop-up with 'Install Ubuntu' dialog box and also have a desktop shortcut option for Installing Ubuntu into the Internal Hard disk . Similiarly I want from Windows. i.e WinPE will load into the RAM and 'Boot to Desktop' and pop-up with 'Install Windows' dialong box and also have a deskop shortcut for Installing Windows within from WinPE. If anybody know about this, then please help me in creating desired 'Win8.1SE_x86/x64_boot.wim' files. 1- Is it possible to make an arrangement so that we have option to choose between 'Boot Index : 1' and 'Boot Index : 2' ? I mean when BCD try to load/boot 'boot.wim' file then it ask for choosing either 'Image Index #1' or 'Image Index #2' so that we can use both 'WinPE' and 'Windows Setup' through single 'boot.wim' file ? Why there is no option for chooseing either 'Image Index #1' or 'Image Index #2' of 'boot.wim' Images ? If anyone know about the concept of these 'boot.wim' Indexes, then Please help me in creating (IF POSSIBLE) 'Win8.1SE_x86_boot.wim' which will ask for choosing betwen 'Boot Index : 1' and 'Boot Index : 2' ?